I haven’t weighed myself this week, so not sure. I Bought a new dress from H&M, just a basic midi dress that will do for both work and the weekends. It’s maternity, but I think I will still be able to wear it post-pregnancy! I’m absolutely in love with it and it was only £14.99, bargain! I’ll pop a link to it here. Still not brilliant, I keep getting woken by kicks which are lovely to feel, but they are so strong they are now waking me up! The weather has been great the past few days, so we’ve been enjoying sitting out in the garden having a drink – non-alcoholic rosé for me! My cousin and his wife also gave birth to their second daughter this week, so really looking forward to going for a visit! I had my whooping cough injection on Wednesday, and I was so ill after it! It wasn’t until I looked it up on the internet (good old Google!) that I realised how bad the side effects were. I felt extremely sick and nauseous, and just ached all over. So if you are advised to get this by your midwife, just be sure you are aware of the side effects beforehand! I’ve really missed the ability to get off the couch gracefully – I feel like a beached whale at the moment! Still very active! Baby J is still breech, so I’ve been bouncing on my exercise ball and doing various exercise to help turn him/her. There’s a great website called Spinning Babies which my midwife friend recommended, that’s given some great tips. I’m off work for a few days, so extremely excited to paint the nursery! (blog post to follow) Also really looking forward to some time off with Tom and Maya, and taking a trip up to Scotland on Monday to meet my cousin’s new baby girl Evie! 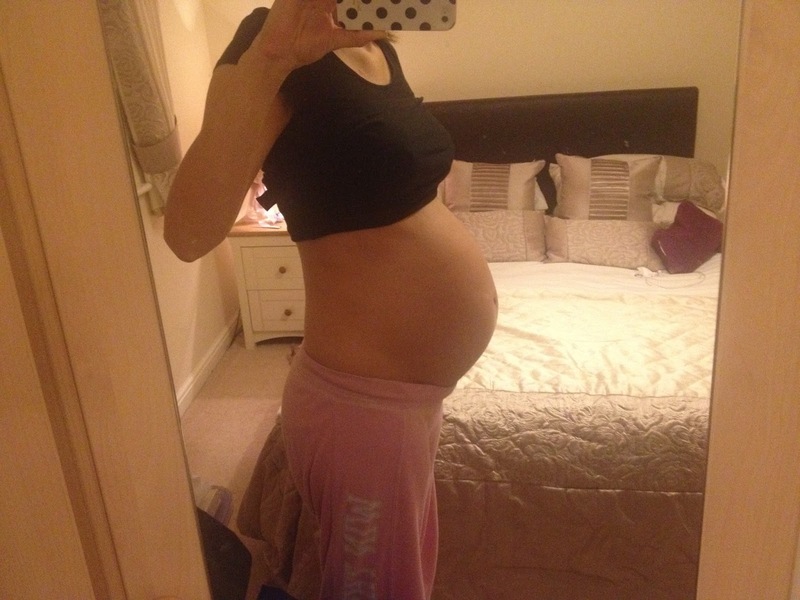 And here is the bump for 30 weeks!